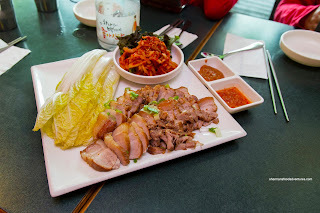 As if one revisit for lunch at Victoria Sushi wasn't enough, we ended up doing another at Nor Boo Korean for dinner. Let me set this up - we were actually at Marshmallow's swank Coal Harbour condo waiting to watch the Canada Day fireworks. However, we needed to eat dinner first! Originally, it was suggested we get some takeout from Urban Fare across the street. However, my son and daughter were being picky, so we ended up taking the walk up to Robson. Then came the complaints about walking too far, so we stopped at the first place after that, and it happened to be Nor Boo. As per usual, we were started off with some Banchan, but for some reason that escaped us, they only brought 3 for the whole table of 7. Not only was there not enough, the logistics of trying to share 3 small plates at a long table didn't make much sense. We had to ask them for more. 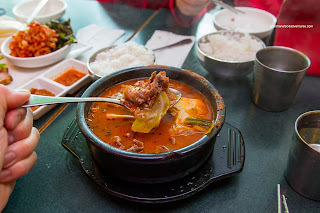 It consisted of stewed potato, sprouts and kimchi. 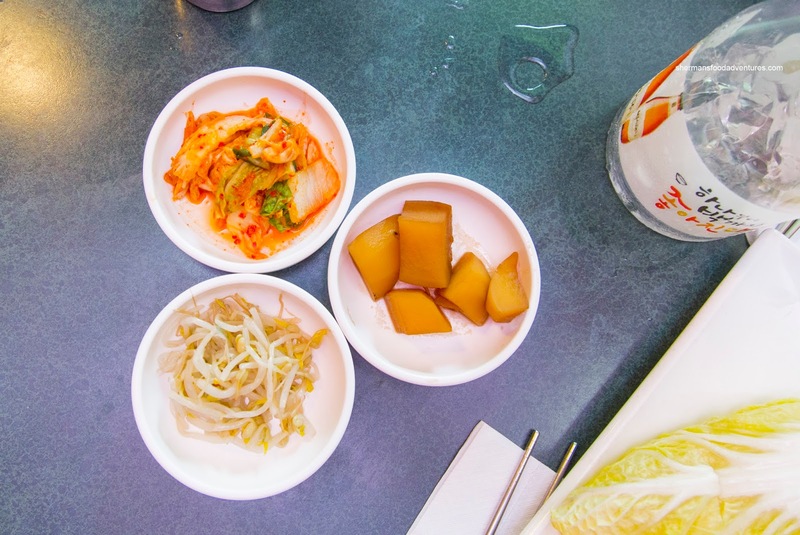 Nothing amiss with the first 2, but the kimchi was far too sweet in our opinion. 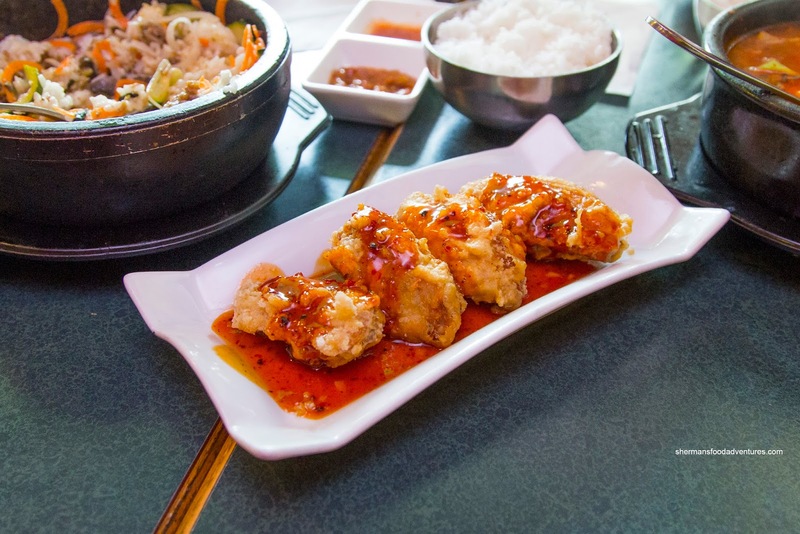 Before our larger dishes, Viv and I shared the Spicy Chicken Wings. They were indeed spicy and predictably sweet as well. The batter on the outside was pretty aggressively thick and crunchy. Surprisingly, the skin underneath was fairly well-rendered whereas the meat was juicy and tender. 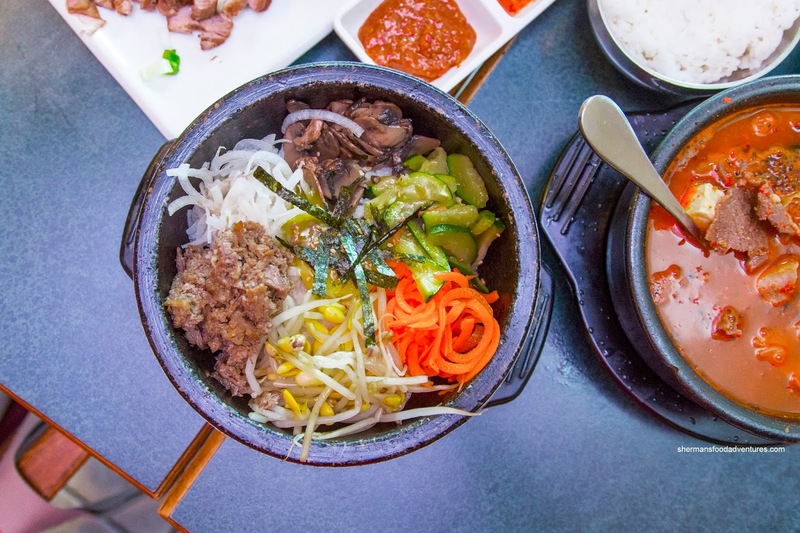 To change things up a bit, we decided to share the Bossam instead of our standby of Japchae. 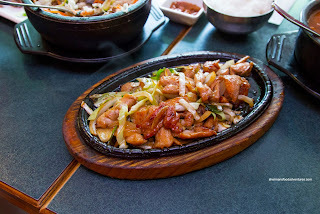 We figured it was worth the extra money as we got a substantial amount of pork belly over some potato starch noodles. Tender with gelatinized fat, the pork belly was well-portioned (as mentioned). Rolled up in the Napa cabbage, it was nicely complimented by the gingery and spicy pickled radish and bean paste. For myself, I got the Intestine Soup which was a pretty standard base being spicy with some tang and aromatics from the perilla seeds. On the other hand, the ample amount of intestine did add some textural variation as well as a slight gaminess. We found the Dolset Bibimbap a disappointment because the rice itself was far too wet. To make matters worse, the hot stone bowl wasn't hot enough to form a rice crust either (probably due to the wet rice as well). Hence, the dish ate very mushy and wasn't aromatic nor did it have the crunch of the crust. On the other hand, there was nothing wrong with the preparation of the toppings. Interestingly, they failed to bring us any gochujang as we had to ask for it. The kiddies shared the BBQ Chicken and it was nicely seared while still staying tender and moist. It was somewhat mild-tasting, with only a bit of sweetness. 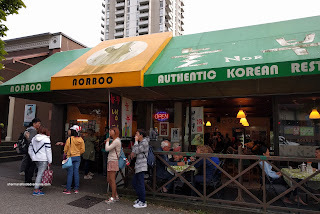 Generally, Norboo is more known as a late-night spot than anything else. Hence, we weren't surprised the food was a bit hit and miss. Service was decent, yet very sparse.